Anything negative? Well, it can sometimes feel a tad on the slow side. The lower the pitch, the longer the time it needs to figure it out. Using the 12th fret harmonic on the lower strings really speeds things up, so it’s not a deal-breaker. A bigger worry, though, is a slight switch pop (in the other pedals) that has appeared since I introduced the Tunemaster. It goes away as soon as I turn the buffer off, and (with the buffer still on) any time I turn one pedal on between the tuner and the pedal that pops. I’ll eventually write a separate article on this subject (what switch pops are, and how to locate the pedal that causes them), but this points to a DC voltage leak from the Tunemaster. And yet… I haven’t been able to measure any such voltage leak from the tuner, so I don’t know what’s up with that. 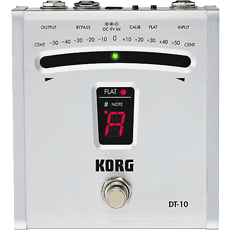 I need to investigate further, and put the Korg DT-10 back on the board in the mean time. It sat for years on the large pedalboard, which was then my main board, but was later moved to the new smaller board. I was intending to use the smaller Guyatone tuner on that one, but once again found I needed a good buffer at the start of the chain, and rather than fit another box on the board, I went for the DT-10. The T-Rex Tunemaster was added to the small board, so momentarily the DT-10 was benched. But now it’s back again, while I investigate a DC voltage leak from the Tunemaster. Modified to true bypass (technically it’s an A/B wiring), which was a pig of a job! I never want to do that again… There’s a quite stiff ribbon cable connecting the main input/output circuit board to the board that holds the tuner circuit and display, and of course it broke off at the solder joints… getting it put back together was really tedious. I have had a couple of requests to mod these to true bypass, but turned them down – it’s just not a job I want to do again. As a tuner, it’s perfectly fine. And there was nothing wrong with the stock (buffered) bypass either, come to think of it. I probably wouldn’t recommend it for intonating guitars, but if you want a simple, small tuner, it’s just fine. I built this one for my own pedalboard, as I wanted to be able to have lots of different effects pedals at my disposal, without having to run the signal through all of them. There are five loops in total, each functioning as a normal true bypass loop – when all loops are turned off, the signal simply passes straight through the loop strip, without touching anything but the switches. The send to the effect is also connected to ground in bypass mode, to help minimize switch pops and other nasty stuff. It is designed so you can use regular patch cables for send and return, or a TRS insert cable (tip=send, ring=return) in the return jack only. At the moment, I’m mostly using insert cables, as it makes for a less cluttered board. Each loop also functions as a proper A/B selector (connecting the unused output to ground) if the return jack is left empty. That way, you can stick a tuner in one of the loop sends (or simply leave a loop unused) and the signal path to the amp will be muted (not just disconnected, but also shorted to ground) when you activate that loop. The loop strip was originally built using regular 3PDT switches, and while they worked just fine, I soon got bothered by the mechanical/acoustic ”click” they made. To some extent, I think the box itself was amplifying the clicks – I have the same switches in regular pedals, where they seem less obtrusive. In this application, however, they were far too loud for quieter situations. So I have since replaced the 3PDT switches with Jack Deville true bypass relay kits, which lets me use soft-touch momentary switches instead. It’s an expensive solution, and fitting it all in the box was a right pain… But the result is smooth, quiet switching. If you’re looking into a true bypass solution where you still want to have a momentary switch (Boss pedals etc), they’re definitely worth looking into. I have a couple of single-loop true bypass boxes that can be used to insert/remove certain effects from the signal path. One is built into a Hammond 1590B-size box (same as an MXR pedal), finished in the same saffron yellow as the ABY below. That one is used for the Korg G4 leslie simulator. I simply run the signal out from the pedalboard to this box and from there to the amp. If I want to use the G4, I simply step on the loop box to insert it. The other one is the one pictured – it’s in a smaller box, but otherwise it has the same wiring as the larger one. Getting all four jacks, plus the 9vDC jack (to power the LED) and the switch in there was a bit tricky – you need to be very careful when drilling the holes, to get them just right. But other than that, it’s just a basic true bypass loop box. I got this one as a gift from a friend, together with the Roland Jet Phaser. I have rewired it to proper A/B wiring – the 270 does connect the unused output to ground, but through a resistor. That means the unused amp (if you’re switching amps) isn’t completely muted, so it can get noisy. I’ve mostly used it as an input selector, to quickly switch between guitars. These days, it doesn’t see much action, though. In lieu of digging my own box out of storage to photograph it, I’ve borrowed this pic from Discofreq’s excellent Effects Database site. If you do an image search for the DOD 270, you will see a fair few different exterior designs, but mine looks just like this one. LR. Baggs Para Acoustic D.I. This box has become indispensable for keeping my acoustic in check. The i-Beam system on my Furch only needs a little eq to sound good – mainly a reduction of 3 dB or so around 10-12kHz – but I have also had feedback problems, due to the large body and the guitar’s top being so responsive. It’s not always feasible to spend time getting the the monitor mix eq:d to fit my specific feedback spots, especially when playing festivals etc, so being able to do this myself – while providing the house system with a balanced XLR output, eq:d to my liking – is simply great. The ”phase” button is also useful – if the feedback situation is bad, and the notch filter can’t handle it (for instance if you have the notch set to reduce the body resonance, and the stage monitors keep getting the top to resonate as well), flick it and you’re instantly off-phase with the monitor speaker. As I sing as well as play guitar, I don’t have the option to back away from the monitors to put me off phase, but that switch does the job for me. Also, it seems to sprinkle some of that ”magic dust” on the sound – even in situations where no feedback reduction is needed, as soon as I plug into this box the acoustic suddenly sounds twice as good (and it wasn’t bad to start with…).